Although the time is not quite yet upon me for potty training to start, I'm aware of how painstakingly difficult it can be, so have started some of the process now! I've done a tiny bit of reading when I've had the odd 5 minutes (so you can imagine how little I've read!) and have used a little bit of the smidgen of common sense I possess. Before reading anything I bought a cheap plastic potty to keep in the living room so he can get used to seeing it around the home. Chunk has only ever sat on the potty if I have put him on it, and the rare times he's even noticed it have involved him throwing it, standing on it or putting toys in it. But this has changed for the better since I received what I can only describe as the MOTHER of all potties. The Smart Rewards Potty*by Safety 1st looks like an adult toilet and even has a flush handle! 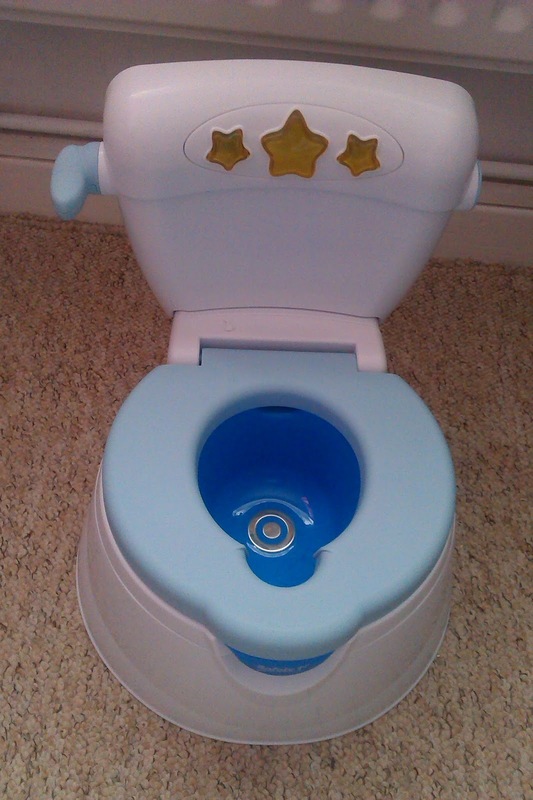 The potty senses when the child sits on it and also when a wee or poo has been done, and it praises the child for doing these things. If they sit on it but don't manage to do anything, it still praises them for trying, and there's a button the parent can use to give them a sticker as a reward! It also plays music, comes with a reward chart to also use the stickers with as praise, and even has a deflector shield for boys to avoid any squirts or spillages! When I got this potty out, Chunk was straight in there;- at first he was obsessed with just the packaging and wouldn't leave it alone! I now keep the potty just outside of the toilet, so he has something to sit on or play with whilst watching me. 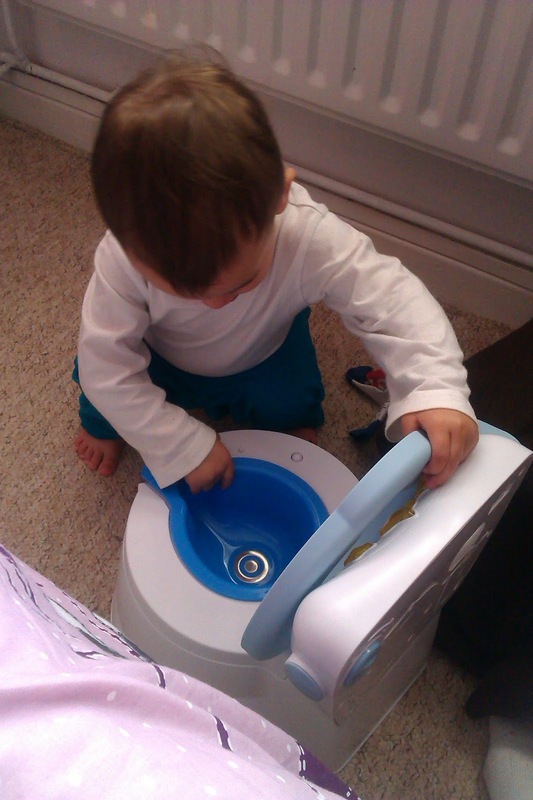 He does occasionally stand in it, but spends most of the time playing with the flush handle, lifting the toilet seat and trying to work out how the magic stickers appear only when Mummy flushes the toilet! I'm looking forward to using this potty for the training in the next few months, and can already see that he is going to have 'bonded' with this potty by that point, which should make the process less painful for me! 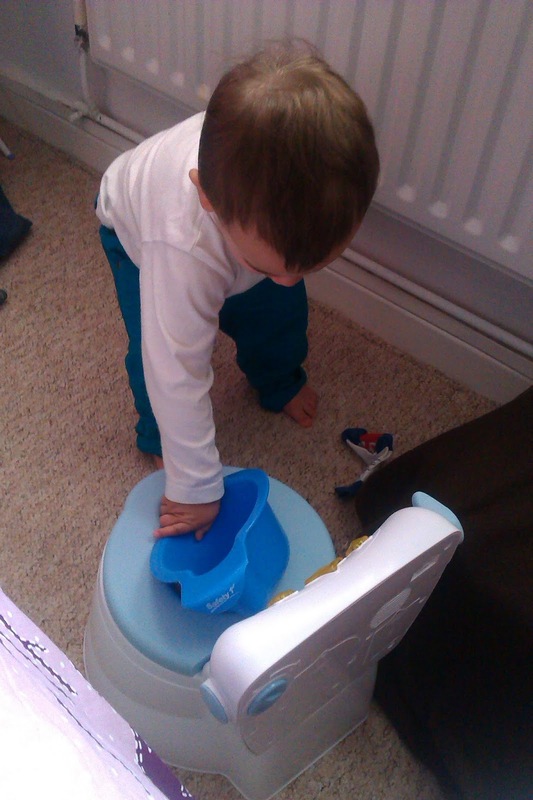 An added bonus is once he has mastered it, the toilet seat comes off so it can be used on the adult toilet. I've always used words to describe what he has been doing whilst he has been doing it (e.g. are you pooing? you're going wee wees!). This helps him to connect the words to the actions, and he may then start being able to tell me when he has done a wee or poo. I've also been looking out for signs he's starting to control his bladder. These 'signs' can be in the form of his nappies getting wet at more specific times of the day rather than just constantly throughout the day, and he is now starting to find it funny to make himself wee when I have his nappy off- he even makes a pushing grunt and laughs his head off! That shows me he is now conscious of urinating and how to do it. I came across a potty training link in my emails this week (see here) and found I was doing some of the suggested tips already, which put a smile on my face! What was really interesting though, was reading that a toddler's very first experience of potty training is simply observing their parents on the loo! This makes sense, as Chunk will always follow me to the toilet (nothing's private anymore!) and has picked up on things like the toilet roll (I cannot count the amount of times I have caught him lobbing whole new rolls into the toilet) and he loves the noises and swirls of the flushing toilet! 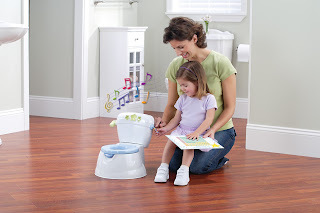 -When they follow you to the toilet, talk them through what you are doing to help them learn (e.g. "I think I need the toilet" and "I'm getting some toilet paper now"). -Get them involved so they can learn what to do, such as getting them to tear off strips of toilet paper or getting them to flush the toilet and help you wash your hands. -Above all the biggest thing is to praise every little thing they achieve, from flushing the toilet, to recognising they need a wee, and even sitting on the potty fully clothed! So with all of this in mind, (as well as my amazing potty), I now feel more prepared in undertaking this somewhat daunting task. I will post regular updates on the process so you can see how we're getting on...Wish me luck! * The Smart Rewards Potty can be purchased from Argos or Amazon and the RRP is £30.